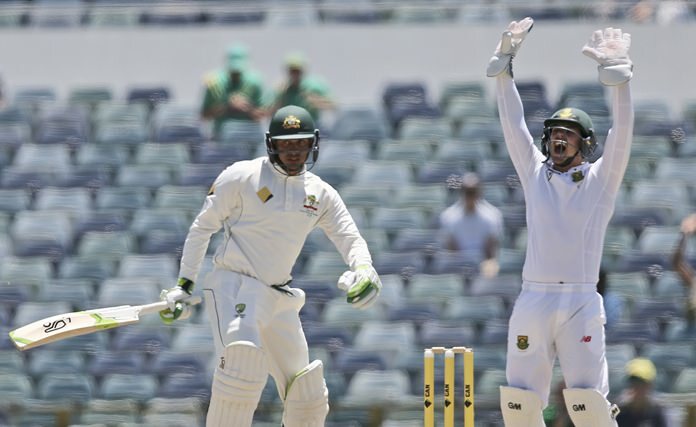 Perth, Australia (AP) — Paceman Kagiso Rabada bowled an understrength South Africa to a 177-run victory over Australia on Monday, giving the visitors the upper hand at the start of the three-test series. The young attack, led by man-of-the-match Rabada’s 5-92 in the second innings, rallied to ensure South Africa continued their unbeaten run in tests at the WACA ground and ended a long streak for the Australians, who hadn’t lost the first test of a home series since 1988. Australia started on top, having the South Africans reeling at 81-5 on the first day before bowling them out for 242. After a commanding start to the reply, with opening pair David Warner and Shaun Marsh putting on 158 runs, the Australians lost 10 wickets for 86 runs. Skipper Steve Smith was unhappy with how Australia have batted recently, starting with the 3-0 test series loss in Sri Lanka in August. “It’s happened a little bit of late and the batters have to work hard to rectify what they are doing out in the middle,” Smith said. “We need to form some more partnerships and get big first innings totals. The depleted South African lineup dictated play from there, with Dean Elgar (127) and Jean-Paul Duminy (141) sharing a 250-run stand for the third wicket to set up South Africa’s 540-8 declared. “Turning things around 360 degrees on the second day is one of the special days of my career,” South Africa captain Faf du Plessis said. “It is 99 percent impossible to win with two seamers … somehow we managed to do it. “This man over here put up his hand and bowled really well,” du Plessis said of Rabada. “I am incredibly proud of him. He basically said you are not taking the ball off my hand … that’s the sign of a champion bowler who wants to be in the fight all the time. Usman Khawaja hit himself back into form and top scored with 97 in four hours. He was unlucky to miss a century when he was trapped lbw by Duminy. The lower order rallied around Peter Nevill (60 not out) to delay the inevitable until tea. After a six-over spell when he claimed Mitchell Marsh (26) lbw, Rabada left the field to ice his bowling shoulder and returned just before the lunch break to trap Mitchell Starc lbw with the second new ball. He finished with seven wickets for the match. Marsh (broken finger) has been ruled for the next test and selectors have added batsmen Joe Burns and rookie Callum Ferguson in a 13-man squad. There is also an injury concern with Voges, who strained his left hamstring in the South African second innings. South Africa have sent for uncapped allrounder Dwaine Pretorious as Steyn’s replacement for the last two tests of the series. The teams head to Hobart for the second test starting Saturday.